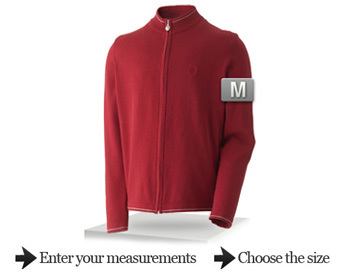 Pretty Green is pleased to announce the launch of the Fits.me Virtual Fitting Room on prettygreen.com. Developed across multiple research centres throughout Europe, the Fits.me Virtual Fitting Room offers the opportunity to enter your measurements and see a virtual representation of how a Pretty Green garment fits on your frame. Speaking about the collaboration, Heikki Haldre, CEO and co-founder of Fits.me Virtual Fitting Room, said "Pretty Green advocates high end British, well-fitted style. Fits.me will allow customers to see how fitted or generous a garment's cut is and make the choices they feel comfortable with. Fits.me does not only fit the customers' sizes - it fits their styles." Nigel Grant, Brand Director at Pretty Green stated "Pretty Green is dedicated to being at the cutting edge of both fashion and technology and so it was logical for us to work with Fits.me. We are confident that this new offering will be highly successful as a large proportion of our customers buy online, and this will be a chance for them to gain a real 'feel' for the product". The Fits.me Virtual Fitting Room is currently available on a variety of a products on prettygreen.com, when you see the 'Try It On' link on a product page you will be able to use the application. We would love to hear your thoughts about the Fits.me application, if you have any feedback send it through to community@prettygreen.com or leave a comment below.